BEACH GOOD NO. 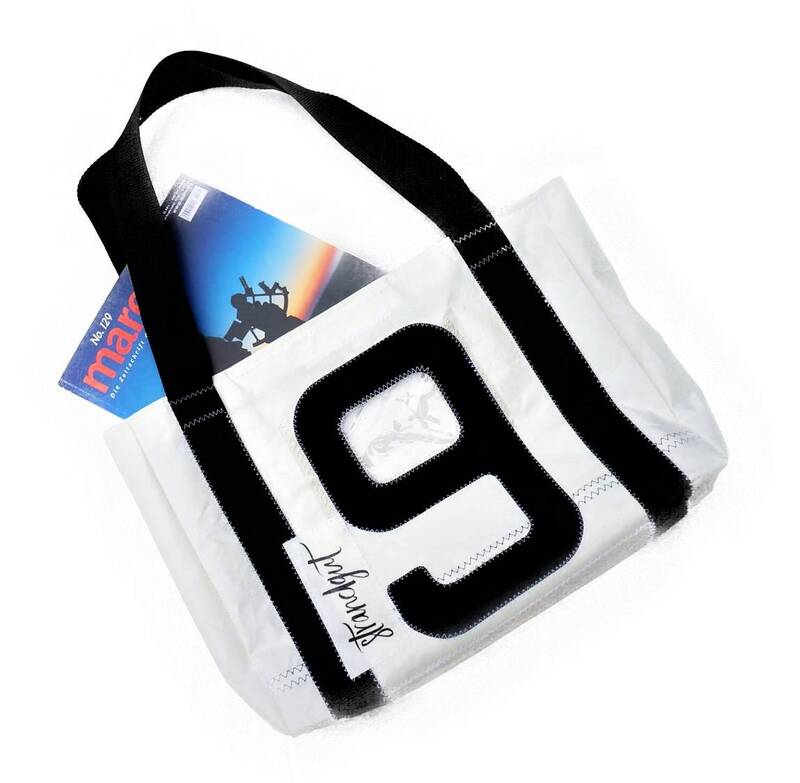 9 is a handmade Roo's Recycled Sails bag made from an original sail. The maritime shopper in the format 38 x 28 x 8 cm is closed with a Velcro fastener. 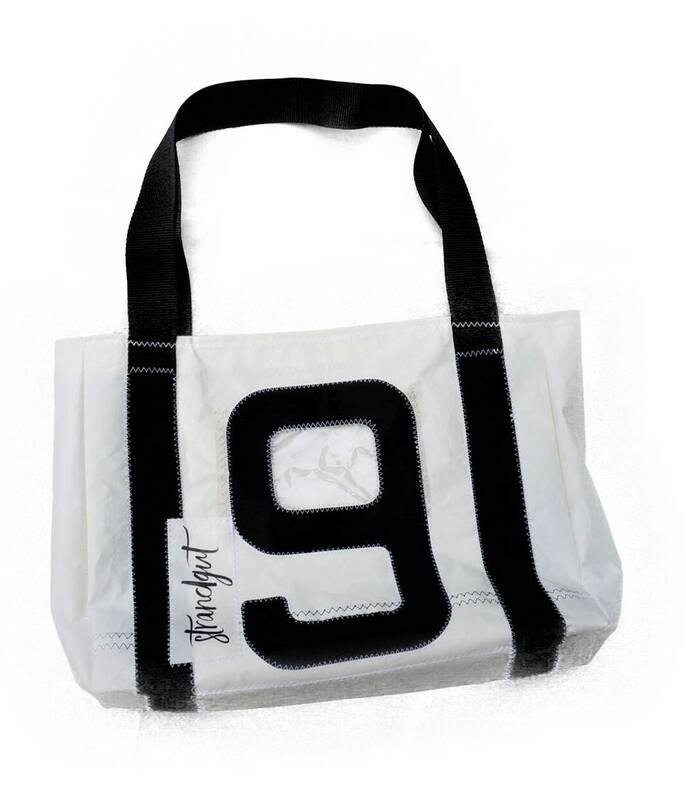 On the front of the white bag emblazoned the number "9" in black. 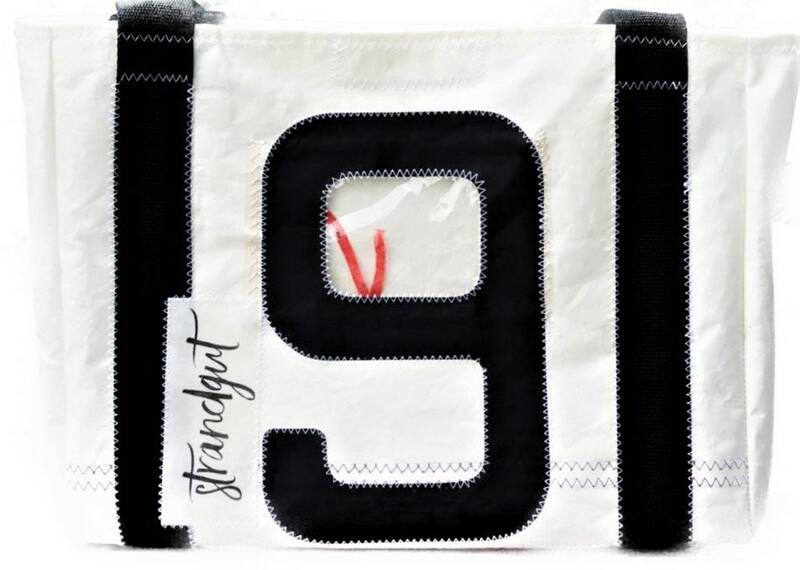 To the left is the word "Strandgut", which gives the bag its name. Just as typical for sails, all elements are quilted with a zigzag stitch, giving the bag its authentic maritime look. At the same time, the front surface between the 4 cm wide black belt straps is worked as an inside pocket with "clear view". The gag: the number "9" is placed so that the inside of the curve lies exactly over a "sail window", i. 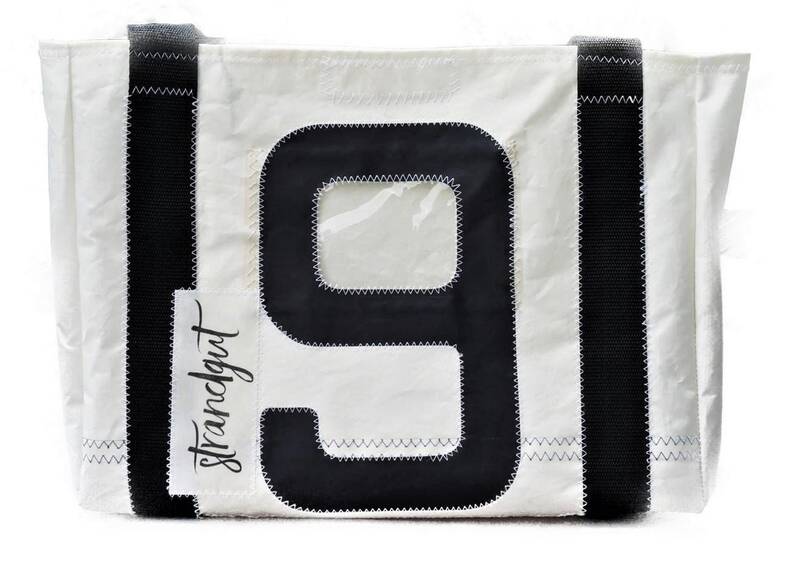 At this point, the bag is transparent and you can see what is hidden in the inside pocket behind the "9". The unlined bag has an additional zipped pocket inside for important items like keys or mobile phones. Furthermore, the geometrically extending nests at the front and rear, as well as the rest of the sail thread, the red dot at the bottom of the bottom, and the red ribbon in the inside pocket additionally ensure the authentic maritime look. 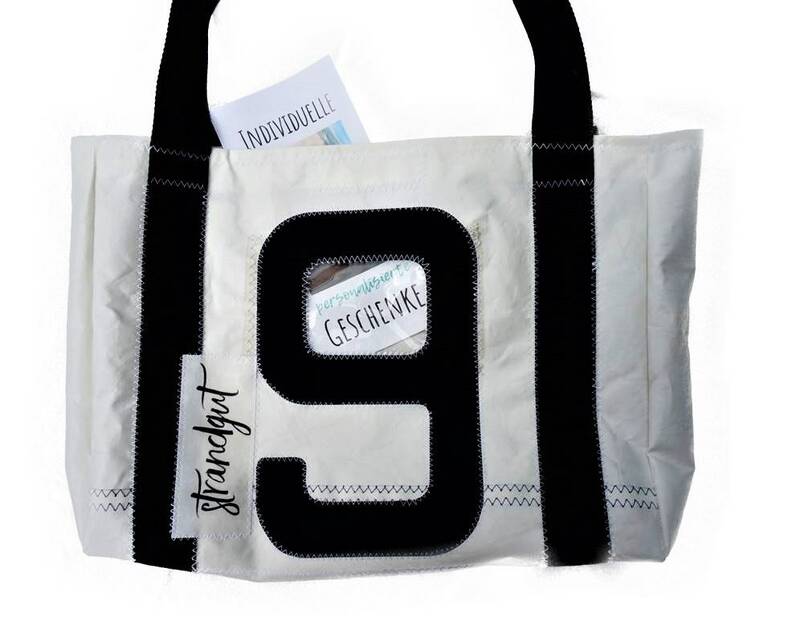 If you love maritime design and are looking for a light, spacious and unique, because unique handmade shoppers, you will find in STRANDGUT NO. 9 a reliable companion. 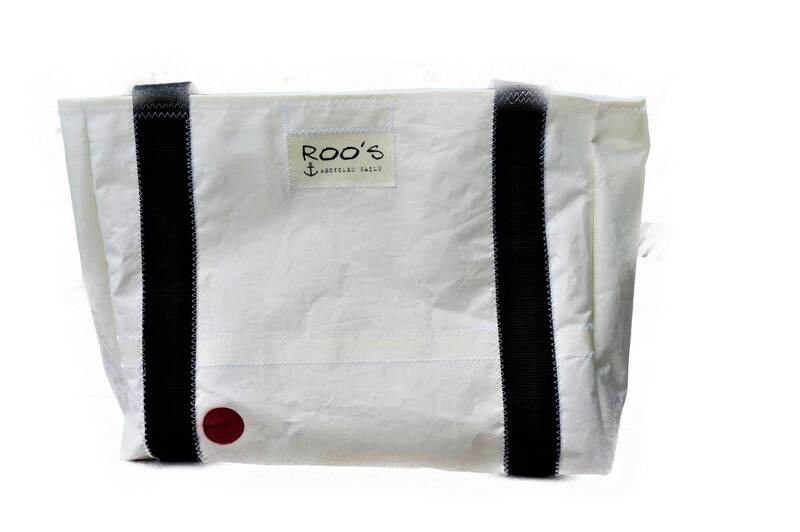 Each sail bag from "Roo's Recycled Sails" is unique, because elements such as transparent "sail windows", "wind indicator", "eyelets" etc. are found only very limited per sail. These elements then become special design attributes that make the crafted piece unique! Important note: Since the sail is needed and starts its second urban life as a bag, signs of use or minor stains, which originate from the first maritime life, unavoidable. Although the sailcloth has been thoroughly cleaned before, small traces are not enough and are therefore no reason for complaint. That's upcycling!